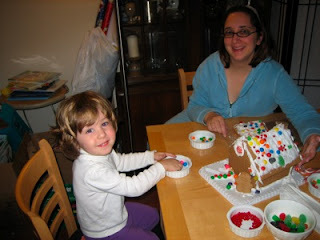 Here we are, feeling festive and decorating our gingerbread house. Of course, the thing you can’t see from this picture is that one half of the roof cracked in half and the remaining half is deftly being held in place by Heather’s fingers, because it’s about to fall off too. Elise had a fabulous time decorating the gingerbread house, though, and we’re looking forward to making another one next year-hopefully one that can be on display for a little longer!